San Antonio, New Mexico Territory, U.S.
Conrad Nicholson Hilton (December 25, 1887 – January 3, 1979) was an American businessman. He founded the Hilton Hotels chain. Hilton was born in San Antonio, New Mexico. His father, Augustus Halvorsen "Gus" Hilton, was an immigrant from Norway. His mother, Mary Genevieve (née Laufersweiler), was an American of German descent. Hilton had eight siblings. Hilton attended school in New Mexico. He was a member of the international fraternity Tau Kappa Epsilon. In his early twenties, Hilton was a Republican representative in the first New Mexico Legislature, when the state was new. He was in the U.S. Army for two years during World War I. When he was a boy, Hilton worked at his father's general store in Socorro County, New Mexico. Later he was a representative in New Mexico's first state legislature. Hilton went to Texas to buy a bank. Instead, in 1919, he bought the 40-room Mobley Hotel in Cisco, Texas. The hotel did very good business. The dining room was changed into more rooms to make room for more guests. Hilton later bought and built hotels all over Texas. His hotels included the Dallas Hilton (opened in 1925), the Abilene Hilton (opened in 1927), the Waco Hilton in 1928, and the El Paso Hilton in 1930. The first hotel he built outside of Texas was in 1939 in Albuquerque, New Mexico. That hotel became Hotel Andaluz. During the Great Depression, Hilton almost had to go into bankruptcy. He lost several of his hotels. He continued to manage hotels, even when he didn't own them. He eventually got his hotels back. During the next decade he opened hotels in California, Chicago, and New York. The hotels included the Stevens Hotel in Chicago (then the world's largest hotel), and the famous Waldorf-Astoria in New York. 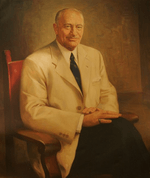 In 1946, he started the Hilton Hotels Corporation. In 1948, he started the Hilton International Company. 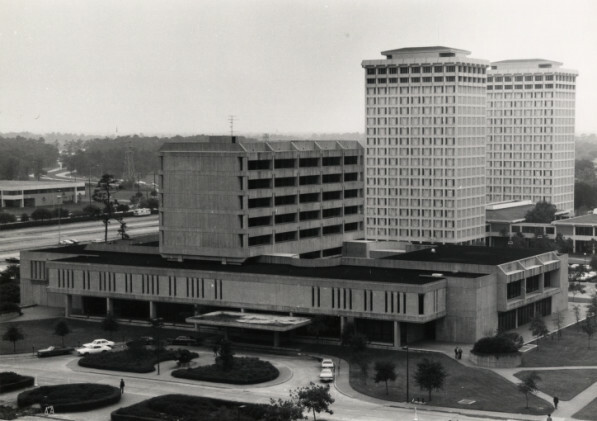 In the 1950s and 1960s, Hilton expanded his business worldwide. He created the first international hotel chain. Hilton eventually owned 188 hotels in thirty-eight cities in the United States. His hotels included the Mayflower Hotel in Washington, D. C., the Palmer House in Chicago, the Plaza Hotel and Waldorf-Astoria in New York City, and fifty-four hotels outside the United States. He later bought the Carte Blanche Credit Company, part of the American Crystal Sugar Company, and other businesses. Hilton received honorary degrees from the University of Detroit (1953), DePaul University (1954), Barat College (1955), Adelphi College (1957), Sophia University, Tokyo (1963), and the University of Albuquerque (1975). His autobiography, Be My Guest, was published in 1957. In 1966, Hilton was elected chairman of the board. His son Barron took over as president. In 1925, Hilton married Mary Adelaide Barron. They had three children: Conrad Nicholson "Nicky" Hilton, Jr., William Barron Hilton, and Eric Michael Hilton. They divorced in 1934. In 1942, Hilton married actress Zsa Zsa Gabor. They had one child: Constance Francesca Hilton. They divorced in 1946. In 1976, Hilton married Mary Frances Kelly. Their marriage lasted until his death in 1979. In 1979, Hilton died of natural causes at the age of 91. He is buried at Calvary Hill Cemetery in Dallas, Texas. Conrad Hilton is the great grandfather of Paris Hilton and Nicky Hilton. Conrad Hilton Facts for Kids. Kiddle Encyclopedia.